RIO DE JANEIRO, BRAZIL – Close to the international airport, a few kilometers outside the center of Rio, lies a large landfill known as Jardim Gramacho. Since 1978, this patch of shoreline has been the final destination for much of Rio’s garbage, but perhaps not for much longer. A major headache for city planners, photo: D'Arcy Norman, Wikimedia Creative Commons License. Several years ago, COMLURB (Companhia Municipal de Limpeza Urbana) – the authority in charge of the site – noticed large cracks appearing in the land around the dump, a sign that the landfill’s capacity was being exceeded and that garbage could escape into the bay. Already, liquid waste had been leaking from the site into the bay, but the prospect of a catastrophic failure in the main landfill finally convinced authorities that a change was necessary. So far, the attempts to decommission the site have been unsuccessful, with various problems persisting. In the latest development, the Department of the Environment has called for the creation of a multi-disciplinary working group, bringing together the various stakeholders, with the intent of devising a final decommissioning strategy. The working group will include representatives from the Duque de Caixas and COMLURB, as well as several government departments such as Culture, Human Rights and the National Aviation Authority. The challenges that face the working group are numerous. 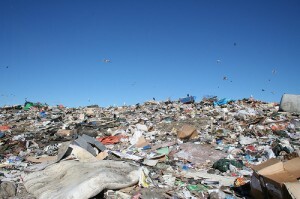 For starters, they must deal with the frequent cases of illegal dumping just outside the designated landfill. Such small-scale dumping began as soon as COMLURB began charging for waste disposal at Jardim Gramacho. Jardim Gramacho entrance point, image recreation. The practice of illegal dumping is very difficult to stop, because there are many unguarded routes in and out of the area. This has led authorities to begin construction of an 8 km fence, which will surround the natural swamps near the landfill. In addition to the fence, the Forestry Battalion have been charged with the task of monitoring all truck movements in and out of the area. Another sensitive issue is the fate of locals that make a living from the site, either by scavenging or recycling the garbage. Some sources estimate 1,500 people work at Jardim Gramacho, although others suggest the number could be nearer 4,000. Certainly, the people that live and work on the site are enduring unsanitary and dangerous working conditions, but they are unlikely to relinquish their homes and jobs without protest. Proposed solutions include the establishment of a unemployment insurance scheme for the workers, who would each receive a cash handout when the landfill finally closes. The other glaring problem, of course, is where to divert the flow of incoming garbage. The site currently receives over 8,000 tones of waste per day, which is just part of the 1.2 million tones generated every year in Rio. The current alternative to Jardim Gramacho is Gericinó in Bangu, although another site, Aterro de Paciência, is awaiting its license. Even if the license is approved, there is a minimum of eight months of work to be done at Paciência before the site is ready to receive any refuse. COMLURB have stated that any new developments will be modern ‘waste treatment facilities’, rather than a simple dump. These new sites will feature trees to hide the landfill from the view of locals, barriers to prevent scavenging and the latest in waste management technology. This latest attempt to close Jardim Gramacho may be just enough to avert a major environmental crisis in Guanabara Bay. However, with all of these factors to take into account, the working group will continue to have a tough job ahead of them.